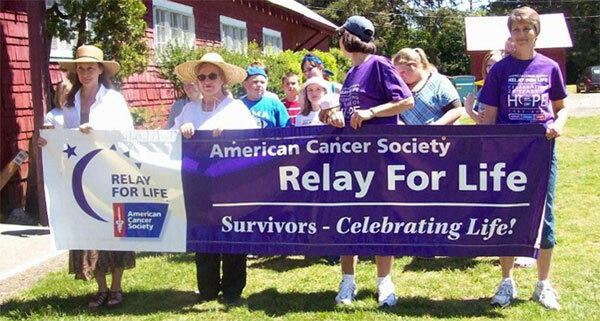 Our school-students and staff-participate in our local East Grays Harbor Relay For Life held the 1st weekend after Memorial Day at the Grays Harbor Fairgrounds. Our relay is a 24 hour chance to celebrate the lives of people who have battled cancer, remember loved ones lost, and fight back against the disease. At Relay, teams of people camp out and take turns walking a track. Each team is asked to have a representative on the track at all times during the event. Because cancer never sleeps, Relays are overnight events. Our school also has a mini relay which is modeled after the 24 hour event. We have a survivor lap, a luminaria ceremony and fundraising. If you’re interested in knowing more or donating, contact us. 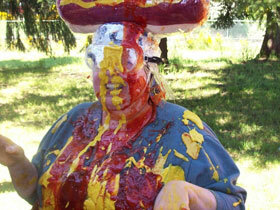 and then fun squirts of ketchup and mustard on Marsha Hendrick. 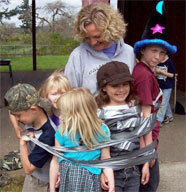 and then students and teachers were duct taped to a post. 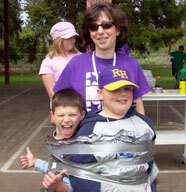 On the left is of Debbie Batten K-1 teacher. 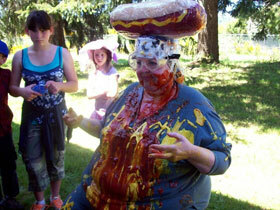 and the photo on the right is Marsha Hendrick 4th-6th grades.